When battery-powered electric mowers first hit the market we were HIGHLY skeptical of their capabilities. Battery life, engine power, and durability were big concerns. Several recent models, including the Snapper XD and our previ﻿ous favorite the EGO, have changed our thinking on these products. Snapper is a well-known lawnmower manufacturer that relies on extensive consumer research to design the best mowers on the market. It’s safe to say that they’ve done it yet again with their latest creation, the 21-inch self-propelled ELECTRIC walk-behind mower. 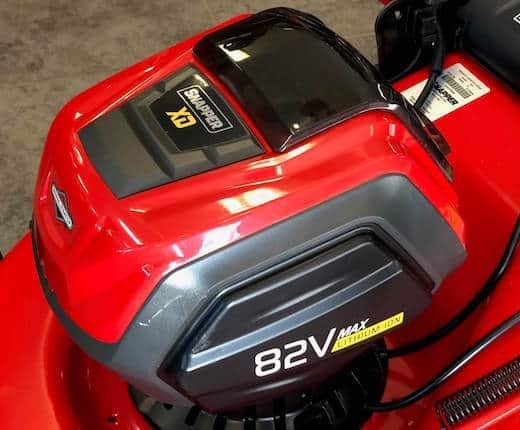 This battery-powered mower focuses on ease of use, light-weight design, and easy maneuverability to ensure it's performance as closely matches it's gas-powered brethren as possible. If you've got a relatively small lawn (1/2 acre or less), and grass that isn't ridiculously thick this mower is a great way to ditch your old gas guzzler. You'll appreciate the clean cuts with no exhaust fumes, and your neighbors will appreciate the low-noise operation. The combination of lightweight materials and powerful motors give this mower a spectacular strength-to-weight ratio that helps you mow your lawn without tiring yourself out. Not only is this self-propelled walk mower lighter, it also mows uneven land better than heavy, gas-powered lawn mowers do. You don’t have to worry about running out of juice half-way through your lawn because the XD uses intelligent battery management and contains two independent power sources. While it's relatively new, the Snapper has quickly become our favorites. You can see how it performed against other battery-powered models. The blades are spun by a 2.0Ah Briggs and Stratton motor that is powered by an 82V battery providing clean cuts and long runtimes. There are two batteries pre-installed into the unit, each one powering the mower for up to 45 minutes. The unit itself is compatible with 4Ah batteries for power users who want to extend the runtime. The mower has a durable 21-inch steel deck and is foldable for easy storage. A lawn mower has never been easier to use with its push-of-a-button ignition, adjustable height, and load-sensing technology that adjusts the power output in real-time based on the required cutting force. Your clippings can be disposed as mulch, retrieved from a bag, or discharged off to the side. One of the biggest benefits of owning an electric mower is the lighter weight. It makes them significantly easier to handle compared to gas-powered mowers. However, the downside is many electric mower manufacturers compromise on the build quality, engine size, and maneuverability just to cut down on the weight. Snapper made no such mistakes with the XD and instead opted to weigh in at a beefy 90 pounds. The weight of the Briggs and Stratton motor and steel deck helps the mower mow over bumps, ruts, and pits of any depth or height. The mower may need some initial adjustments to compensate for the weight, but the benefits of its durable frame and powerful motor make the extra weight a fair trade. In fact, this mower’s performance is comparable to that of gas mowers. We would recommend that you upgrade the pre-installed 2Ah lithium-ion batteries that come with your Snapper XD. Each battery can power your mower for up to 45 minutes after being charged for half an hour. Swapping the batteries is relatively easy as all you have to do is press a button to release the cell. While the stock batteries are sufficient for most users, the mower is compatible with 4Ah Snapper XD Max batteries for those who want more out of their units. The 4Ah batteries take twice as long to charge but will keep your mower running for much longer. The long runtime of the mower is a direct result of the artificial intelligence (AI) that adjusts the motor’s power output depending on the intensity of the workload. When trimming your grass, the mower dials down the power output to preserve battery life, but when you start to cut through thick weeds, the load sensor increases the power output to slice through the tough stuff. Despite its hefty weight and thick frame, the Snapper XD is surprisingly easy to use. It fires up at the push of a button and can be easily steered with the ergonomic handle. Not only is the handle ergonomic, it’s also foldable to allow for easy storage of the mower. In fact, the foldable handle saves 70% of storage space that would be used if the handle was fixed. The XD is also easy to use from a psychological standpoint. You'll be surprised (we were) at how much more pleasurable it is to mow your lawn when you're not being bombarded with noise and exhaust fumes. The load-sensing AI doesn’t just preserve battery life, it also makes for a more even trim. The fact that the power output of the motor is dynamic allows it to maintain a constant speed no matter what type of terrain it encounters. Bear in mind that thicker grasses such as St. Augustine and Bermuda will take more power to cut and as a result drain your battery faster. Be sure to adjust the height of your mower’s deck so that it is tailored to the conditions of your lawn. Whether you decide to mulch, bag, or side-discharge the clippings, you’ll end up with a neat finish that is sure to make all your neighbors jealous. 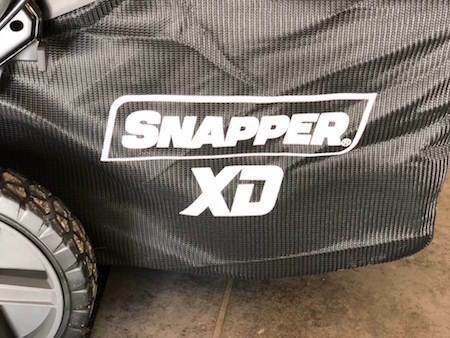 Like most high-end lawnmowers, the Snapper XD doesn’t require much maintenance. Sharpening the rotor blades annually should be more than enough to keep it running at its optimal capacity. While you can get away with skipping this on many gas mowers, you'll notice a significant improvement in performance on electric mowers if you keep the blades sharp. As with any electric device, be sure to store it in a cool, dry place. We advise that you read the warranties of the mower and batteries to see what’s covered and what isn’t. Just like with any current gas-powered mower the Snapper utilizes a blade engagement lever. As soon as this lever is released the engine disengages and the blade stops spinning. For safe storage you should remove the batteries whenever the mower is not in use. Placing them in the charger is a good idea as it keeps the batteries topped up at all times. While its price is at the higher end of other electric mowers, the Snapper offers significantly more power than it's competition. In addition the only maintenance required is seasonal sharpening of the mower blades. With a gas mower you'll need regular oil changes, fuel, and air filter changes. You should also drain the fuel from your gas mower at the end of each season. This unit only requires you remove the batteries for long-term storage. 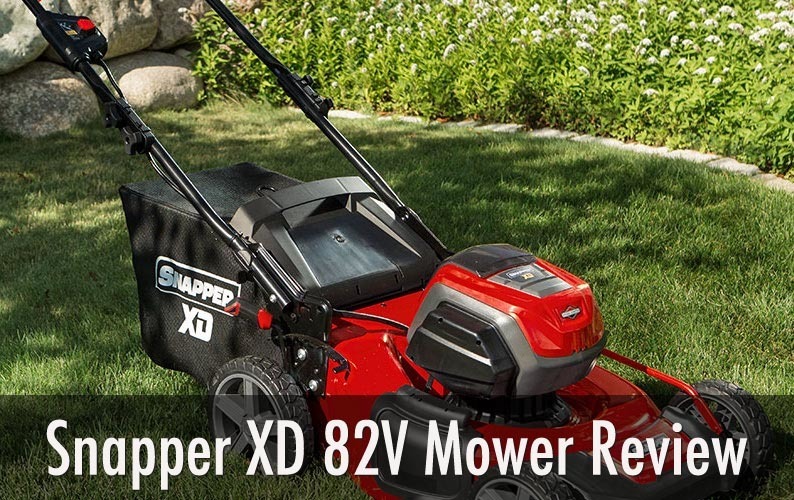 ​If you're looking for a way to go electric without sacrificing the cutting power of a gas-powered mower, the Snapper XD is now our top pick. It offers lots of power, it's self-propelled, and you can easily mow up to 1/2 acre (more with thinner grasses) without recharging. Yes it's price point is similar to a gas mower, but the money you'll save not buying fuel will QUICKLY make up this difference.